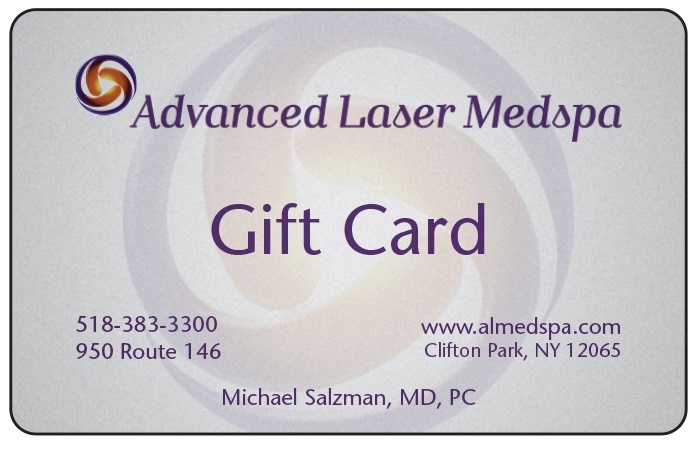 Gift Cards | Advanced Laser MedSpa - Michael Salzman, M.D. A great gift for any occasion, gift cards may be purchased in person, by phone or online. Gift cards are available in different amounts. From $50 to $1000 of even more. Receive an additional $10 for each $100 purchased, as a separate gift card. For example: If you buy a $500 gift card you’ll get an additional $50 gift card. Gift Cards and Pre-Paid Services are a final sale and cannot be returned, refunded, or redeemed for cash. Treat it as cash. A Gift Card must be present at the time of redemption. For balance inquiries or to report a lost or stolen card, please call 518-383-3300. Cannot be used for prior services, packages, or purchases. Complete the form below to purchase a Gift Card with a value of your choice. The Gift Card will be mailed as soon as possible, or you can pick up until December 31st. Shipping and handling are free.